Most of the images of Milton below were created in the latter half of the 19C and early years of 20C. The first eight are linked to the map of the village which shows the approximate position of the cameraman/artist and the direction of the scene depicted (click on the map to display). Further down the page the location of some of the images cannot be identified with the same degree of confidence and are accompanied by as much evidence as is available. All images can be enlarged by clicking on them. Most of the photographs are held by Portsmouth City Museum, though some are derived from private sources which have not yet been identified. 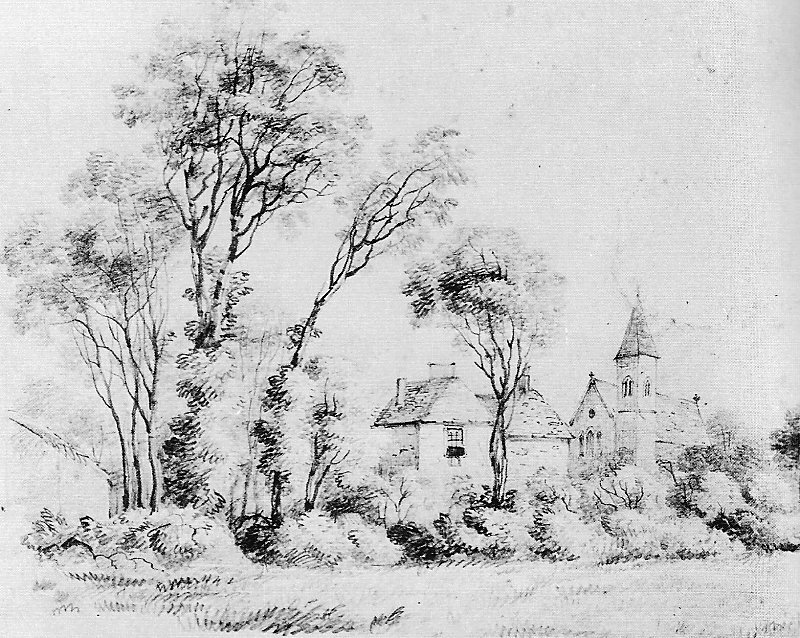 A drawing made from the southern side of Middle Farm showing the south end of the farmhouse and the tower of St. James's Church, probably dated to the second half of 19C. 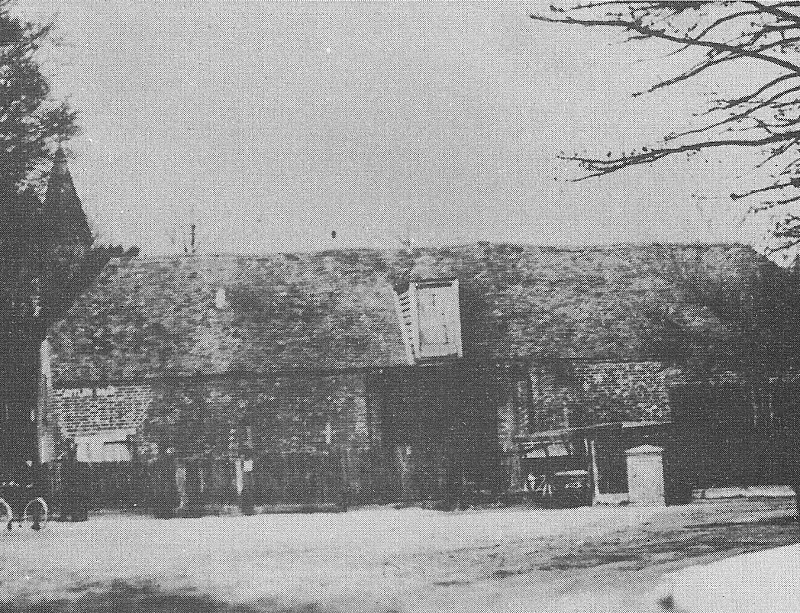 A photograph of the barn at the corner of Milton Road and Milton Lane (later Locksway Road). The land on which stood the barn was in the occupation of James Ellis in 1845. 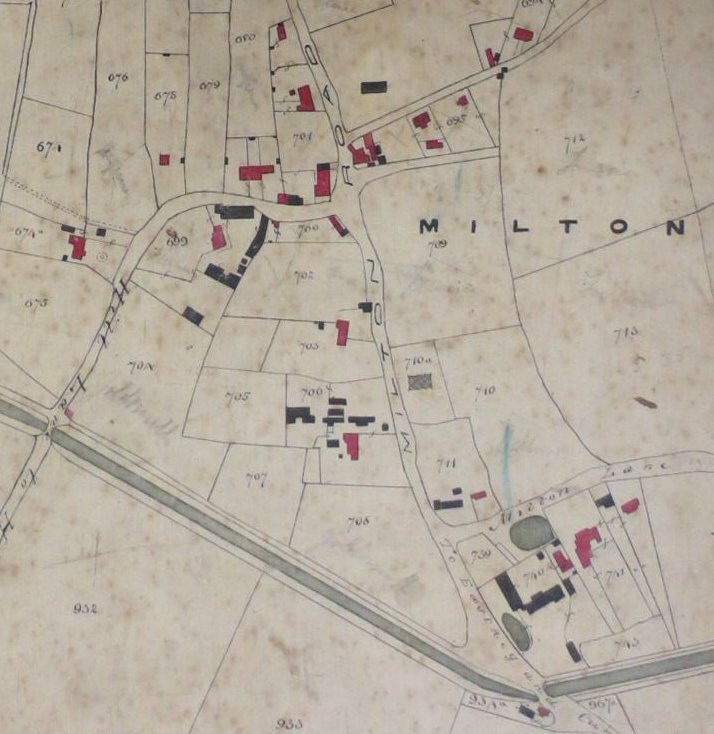 Ellis was farming from Lower Milton Farm across Milton Lane at the time. It was later purchased by James Goldsmith. 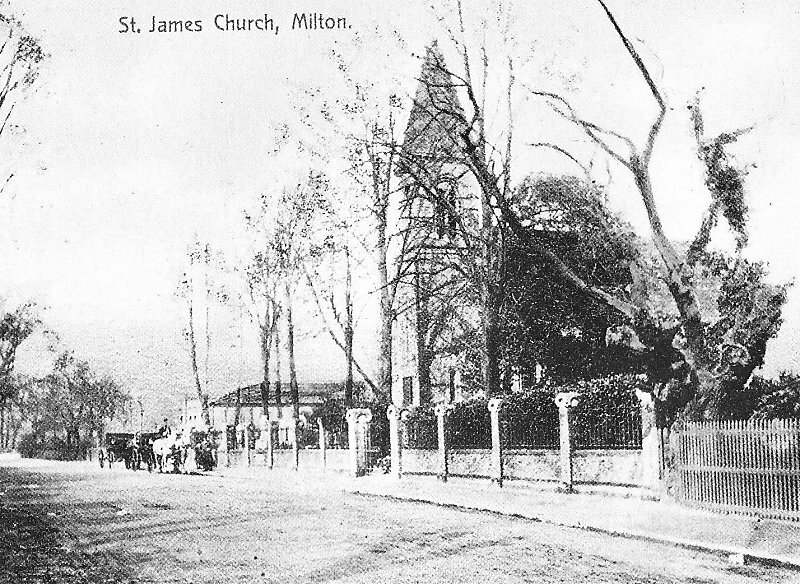 A photograph showing St. James's Church from a position on the west side of Milton Road, south of the church, probably taken in late 19C. Taken from Milton Road looking west past the Congregational Church on the right towards a group of cottages owned by the Leggatt family from at least 1750 until they were sold to James Goldsmith in 1858. 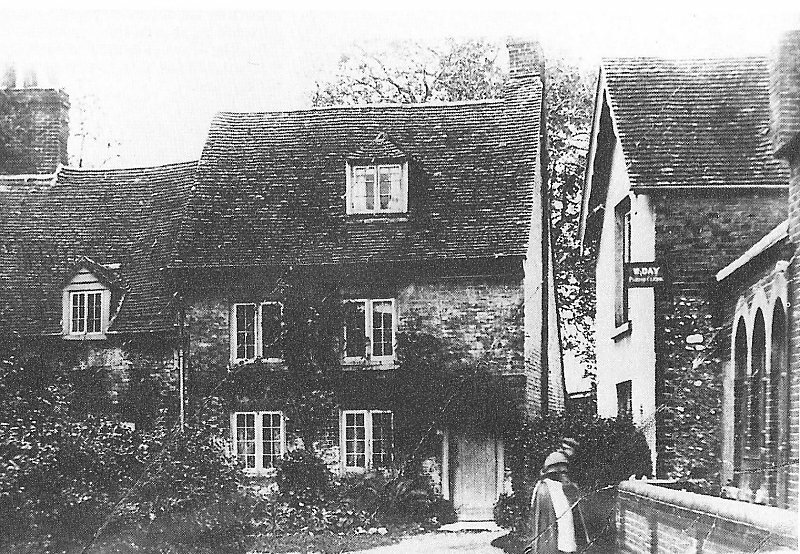 The cottages survived until after WW1. 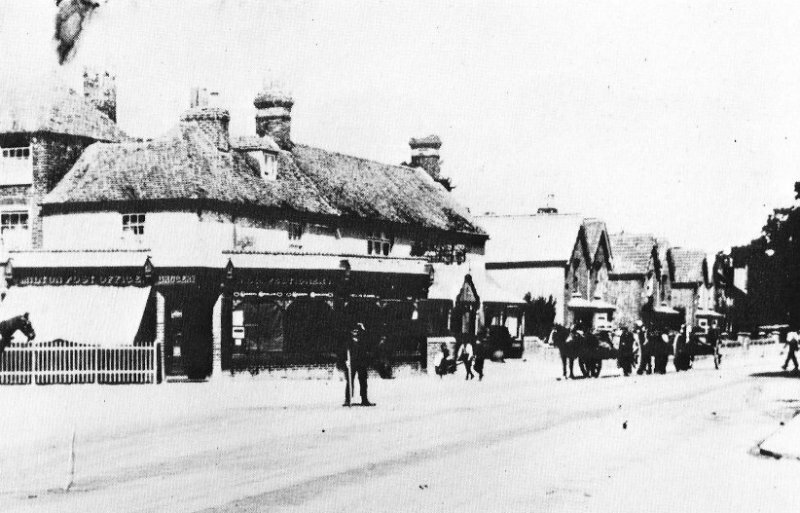 A photograph taken around the turn of the 19C showing the Post Office on the corner of Milton Road and Hill Lane (Priory Crescent). Much of this building has survived as The Brewers Arms. Some of the houses on the right were destroyed during WW2. The first village Post Office was beyond those houses, in a cottage on Prospect Terrace. The Traveller's Joy public House was just off the picture to the right. These two buildings were jointly known as Milton Place and were situated on the north side of Hill Lane. The cottages on the right would have pre-dated the three storey building on the left. They are known to have survived well into the 20C. Taken close to the junction with Milton Road this photograph shows the view down Hill Lane. 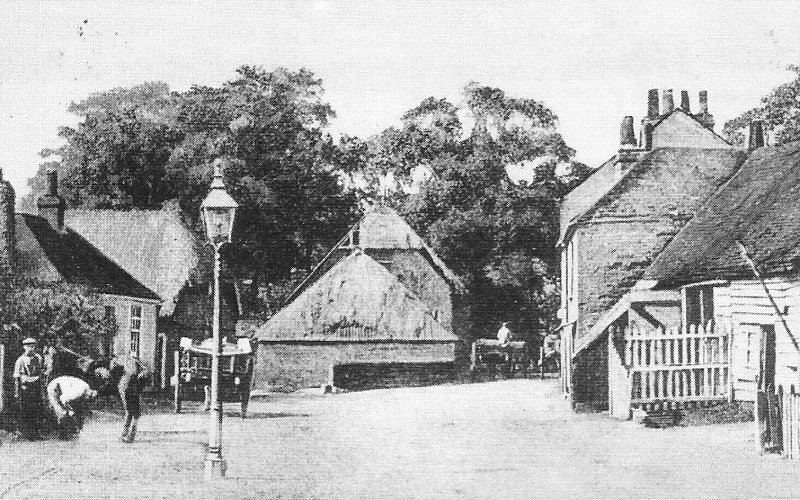 The blacksmith's shop is on the right whilst the farm buildings in the centre were part of Edward Turner's Milton Farm. The presence of the gaslight shows the image was taken after 1859. 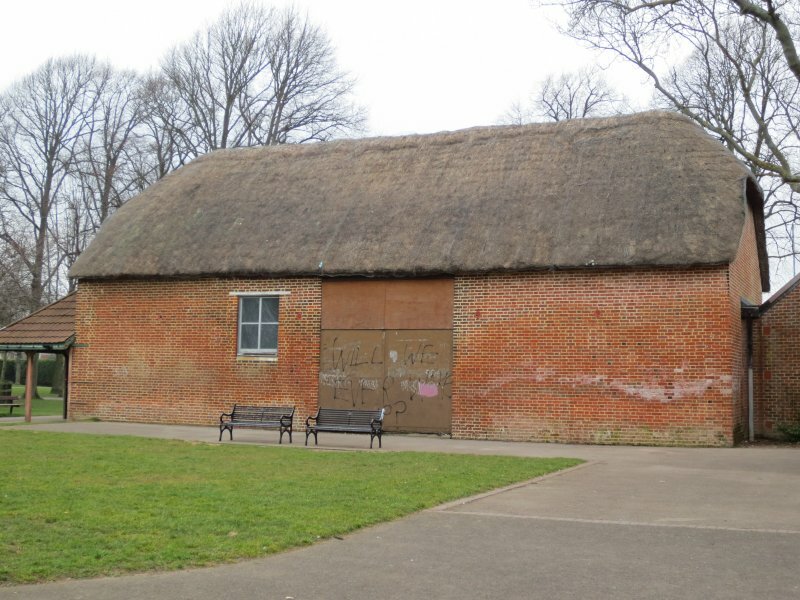 A modern photograph showing the only building from the 19C still standing in the middle of Milton Park. This image has been reproduced several times in publications but has been described as showing quite different places. One of these is Prospect Terrace which was situated on the west side of Milton Road just north of the junction with Hill Lane (Priory Crescent) adjacent to the former Cremorne Gardens public house which was later renamed Mr Pickwick. The other was on Ironbridge Lane, also known as Engine House Lane which was a road leading south from Milton Lane (Locksway Road) from a point opposite the entrance to St. James's Hospital. 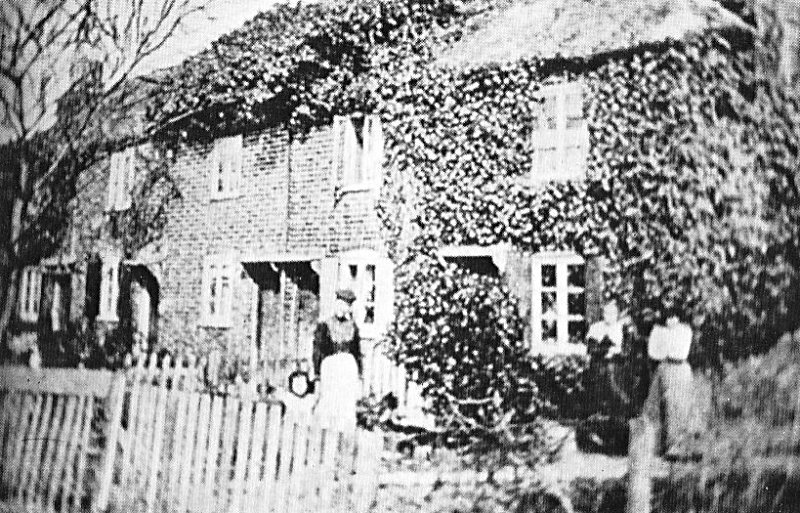 Information from Julie Scarrott, whose father lived in Prospect Terrace until the 1940s, and provided an excellent photograph of their home, confirms that the image must be from Ironbridge Lane. 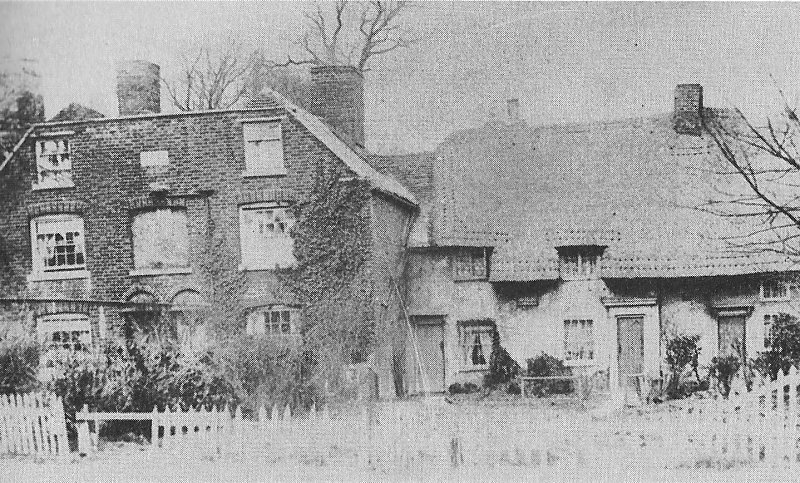 This image is inscribed 'Old Farmhouse Milton Park' and this has led commentators to suggest that it was the farmhouse belonging to the Goldsmith family as theirs was one of only two such buildings on the land later to become Milton Park. The problem with this is that this house cannot be the same one as that depicted in Image No. 1 as the gable end is quite different. It is possible that this view is from the north and what we are seeing is perhaps a labourer's cottage attached to the farmer's house. This explanation may be supported by gable ends that can be seen beyond the cottage and which may be the Goldsmith's farmhouse. 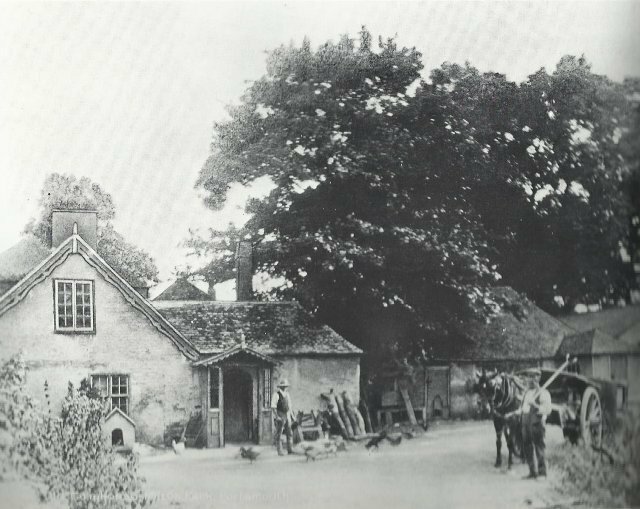 In his 'Memories of Milton' George Rogers says that the two figures in the photograph are Mr Greenwood and Mr Newland, both employees of the Goldsmiths and that the barn in the rear is the same one that still survives in Milton Park. There is no further evidence about the men but the barn in the photograph does not have walls as high as the surviving barn seen in Image No. 8. Shepherd's Bridge spanned the old canal where modern day Winter Road/Priory Crescent crosses Goldsmith Avenue. 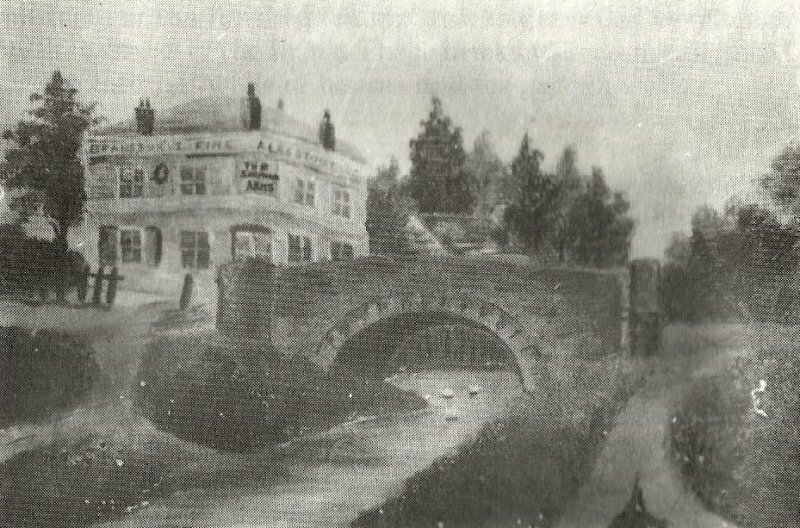 Image 11 appears to be a painting made sometime after The Shepherd's Arms was built in the early 1860s and before 1896 when the canal was filled in. It seems extraordinary that a pub of such a large size should have been built at this point where there were very few houses and little passing trade. In 1908 it's licence was transferred by the then owner James Goldsmith diagonally across the road junction to the site of the Shepherd's Crook. The Portsmouth and Arundel canal had been out of use for 60 years when this photograph was taken c1900. 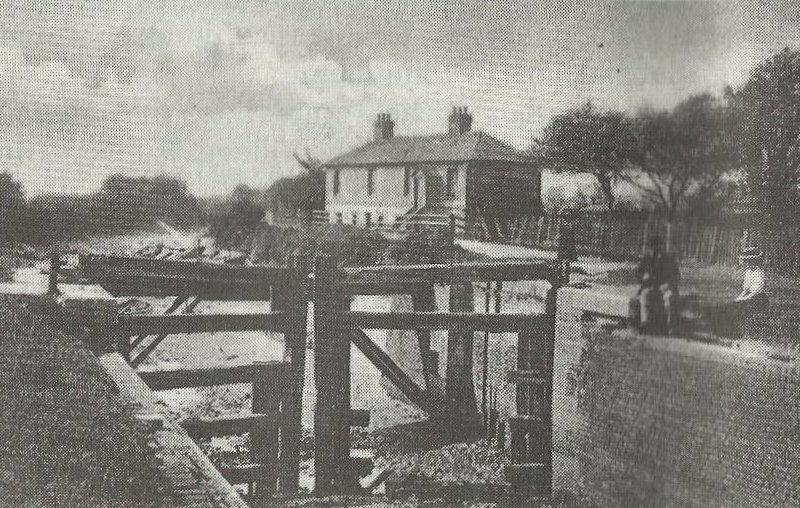 It shows the derelict lock gates, close to the site of the modern Oyster House pub, with the Lime Kiln Cottages in the background.